1. Combine all ingredients, except for honey, liquid smoke and Tabasco in a large pot. 2. Simmer for hours and hours until very thick, stirring occasionally, more so as it thickens. 3. Add honey and simmer another 30 minutes, stirring more frequently to prevent burning. 5. Taste and add Tobasco Hot sauce if you see fit. 7. Transfer to a blender and puree well. To substitute fresh tomatoes for canned juice, use six pounds, cored and skinned. See the videos below. The initial simmering will take 6-8 hours. Halving the recipe will halve your simmer time. Adding the liquid smoke in the beginning can greatly diminish it’s flavor so it’s better to add it at the end when the simmering is done. Regarding liquid smoke: I use Wright’s Hickory or Mesquite Liquid Smoke. The labels list no illegal ingredients. I emailed the company to be sure and they confirmed the legality. Find the exchange below. of refined sugars, gums or starches. or refined sugar, gum or starch? Wright’s Liquid Smoke is a natural product that gives foods a charcoal broiled taste. It is made from hickory wood that is burned in an enclosed unit. As the smoke rises it is captured in a condenser, allowing the smoke to cool. The cooled smoke forms water droplets (condensation). The condensation droplets are collected in a pan, filtered and placed in 55 gallon drums. The drums are taken to the production filling location where it is filtered for a second time and transferred to the filling line. The bottles are filled, capped and labeled. They are then placed into shipping cases ready for distribution. It contains no salt, carbohydrates, sugars, gum, starches, food additives, colorings or carcinogens. It is designated “natural” by the FDA. Some other liquid smoke brands do contain illegals so read carefully. Here’s an article on Slashfood about liquid smoke. In the interest of full disclosure it should be noted that the gold standard for investigating a processed food as set forth by Elaine Gottschall is to get a physical letter from the company on official letterhead with a person’s title and signature. By this measure, my investigation fails as I conducted it by email. Given this specific product and that most communication now takes place electronically, I am personally comfortable with the validity of the email exchange. You will have to decide for yourself where your comfort lies. Smoke some onions or other vegetable on your grill and use them in the sauce (Thanks to Marilyn on the BTVC-SCD group for this suggestion). This short video shows you how to remove the skins from tomatoes. 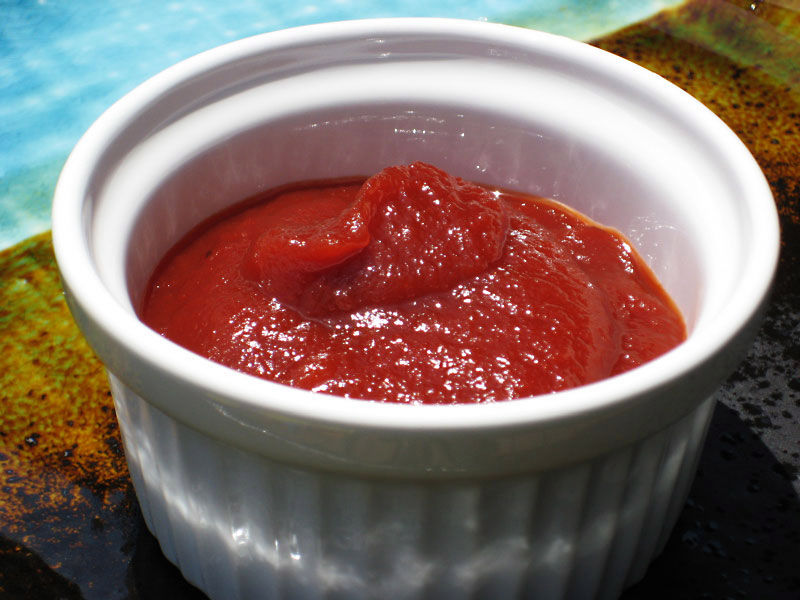 Making ketchup from scratch. Same method, slightly different ingredients. This looks good. I wonder if you could do this in the crockpot. To be able to reduce the tomatoes or juice, you need a good rolling boil. I’ve never tried, but I doubt that my crockpot could do this. My crockpot has only high and low settings and as such, I don’t know if I could get the temperature low enough once the honey was added. My suspicion is that a crockpot would not be the best tool to make bbq sauce. I’ve got a video in the works for making ketchup that I’ll post in the near future. Check back to see if it might help. I use my crockpots all the time to reduces sauces, juices, fruits. I leave the top off so the H2O doesn’t condense right back into the pot. I cover with a towel to preserve the heat. Stir occasionally. Leave on until the desired consistency is achieved. Yummy peach “jam” obtained by peeling and chopping peaches and putting in crockpot as above. Add cinnamon if desired. I just made a half batch of this sauce and it’s delicious. I might add a little less vinegar next time, as it gives me a bit of heartburn. I’ve seen other BBQ sauce recipes that only use 1/4 cup vinegar per batch. So, I might try a 1/2 cup in this case. Otherwise, I love this stuff. It’s great with home-cooked beans, too. I’m glad you like it. Thanks for letting me know as I appreciate the feedback. Hmmm, beans eh? I’ll have to give that a try. Which grocery stores carry Wright’s Liquid smoke? I visited Wright’s website and they were no more specific than “found in stores nationwide”. I’m assuming they mean in the USA. Whichever store I’ve found it in, it has always been in the condiment section along with hot sauce, bbq sauce, ketchup, etc. Thank you so much for the recipe. I just added the honey and it’s been about 20 minutes, and then I tried it for the first time..wow! that tastes good! I used Wright’s Hickory flavored liquid smoke and I also did this in a crock pot. I let it simmer for about 20 hours until thick, then I will let it simmer with the honey for about 30-40 minutes. So at least for our crock pot it does seem to work alright. Thanks again, I will be checking our some of your different recipes too. I’m glad you like it. Thanks for the crock pot tips. I put it on high the whole time. A question, though: how long do you think this sauce would last in the fridge before going bad? I thought that the vinegar would help preserve it but the fresh onions and garlic might make it go bad quicker. What do you think? I’m planning on keeping a cup or so in the fridge from this batch, and then freezing it in 1-cup portions so it won’t all go bad before I can use it all. Do you know if this recipe freezes well? I think that it would last in the fridge at least a month. I don’t think I’ve ever had it around that long as once I have a pint open, it use it up pretty fast. I preserve my sauce with hot water bath canning and that gives it a shelf life of something like a year. Freezing should preserve it for at least six months. I suspect the worst that would happen with freezing is that it might separate and need remixing when thawed. Made your ribs yesterday and they were fantastic! My husband was soooo happy. We have been on SCD since October 2010 and he was missing his bbq ribs. This was lipsmacking good! Thanks!!!!! Thanks for sharing, that makes me happy to hear. I don’t remember. Maybe 30 oz? I used 2 – 700 ml bottles of organic strained tomatoes and 1 – 26.46 oz carton of Pomi chopped tomatoes. I reduced this until it looked thick enough and ended up w/BBQ sauce that pretty much filled a 10 cup/2.5 litre pyrex bowl. I did end up doubling all the other ingredients except the liquid smoke for my taste and yes the end product is absolutely divine! Thanks! I don’t think I doubled the onions and garlic nor the honey, just the spices FWIW.